Our pool is 9 feet wide, 21 feet long and 4 deep. We use an EPA approved UV Sanitizer, making our pool virtually chemical free. 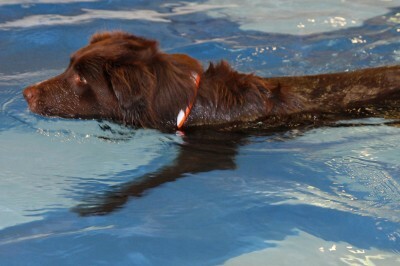 We also have adjustable swim jets that provide more resistance for active and fit dogs. We swim dogs of all shapes and sizes. We have experience with dogs as small as 2 lbs all the way up to 190 lbs. The temperature is set at 85 degrees. All swim sessions are private. 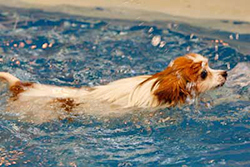 Our trained swim coaches get in the water with the dog and assist them as much or as little as needed ( help them in, help them swim, control direction of movement, resting, getting out of the pool, etc). 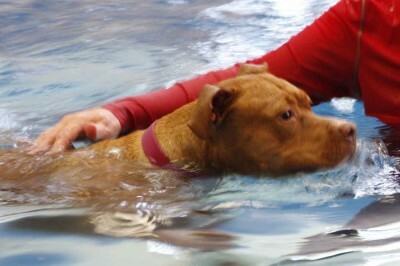 Each session is personalized to the individual needs of the dog. We provide towels for drying the dogs off. We have a shower stall if you want to rinse your dog off after swimming. We also have an air force dryer that you may use as time allows. We have toys of all shapes and sizes, and use grain free treats for dogs who are more food motivated. 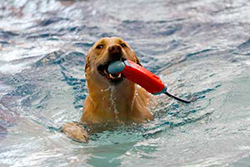 We provide life jackets as well, and use them during the Initial Swim Assessment and as needed on an ongoing basis.